iOS 10 was introduced during Apple's Worldwide Developers Conference on June 13, 2016 and was released to the public on September 13, 2016. Raise to wake added with new lock screen with gestures for accessing the camera and Today view. Significant Messages improvements providing new effects, Tapback for quick replies, create handwritten messages and heartbeats, automatic text emojification. Messages now support apps and sticker packs. Support for third-party VoIP for receiving calls on the Lock screen. Portrait Camera for new iPhone 7 Plus introduced creating a depth effect. 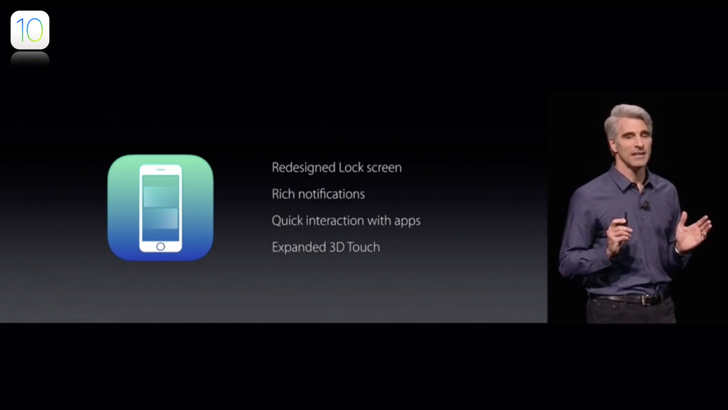 TV app introduced, replacing the Videos app users are now presented with Up Next and recommendations.